Below is the rush transcript of "This Week" on November 30, 2014. It may contain errors. ANNOUNCER: Starting right now on ABC THIS WEEK -- Ferguson fury. Demonstrations spreading across the country. Dozens more arrested this weekend. And breaking overnight -- Officer Wilson resigns -- why he stepped down and will it stop the unrest? Overturned -- running back Ray Rice wins his appeal -- another black eye for the NFL. How will the league and its embattled commissioner respond? Hurry up and wait -- on the busiest travel day of the year, we asked the head of the FAA, can anything be done about those long lines and delays. UNIDENTIFIED MALE: This is President Obama's jacket. UNIDENTIFIED MALE: Only the president? UNIDENTIFIED MALE: Only for presidents, this thing ISIS. UNIDENTIFIED MALE: The man who's been styling the presidents for 60 years. UNIDENTIFIED MALE: From ABC News, "THIS WEEK WITH GEORGE STEPHANOPOULOS begins now. And as we come on the air this morning, breaking news from Ferguson, Missouri, where has confirmed Officer Darren Wilson has resigned from the Ferguson police force. The big question -- will that resignation calm the protests in Ferguson and around the country? Let's get right to it with Alex Perez, who joins us now from Ferguson with the very latest -- good morning, Alex. ALEX PEREZ, ABC NEWS CORRESPONDENT: Good morning, Martha. A relatively quiet night of much smaller protests here in Ferguson. Just two arrested. Wilson says he hopes his resignation will bring peace. PEREZ (voice-over): Darren Wilson, a three year veteran of the police department in Ferguson, said he had hoped to continue in police work, a job he told George Stephanopoulos that he loved. DARRELL WILSON, POLICE OFFICER WHO KILLED MICHAEL BROWN: I greatly enjoyed working in Ferguson, I did. GEORGE STEPHANOPOULOS, ABC NEWS ANCHOR: You put that in the past tense. It's not going to happen again? WILSON: I don't think it's possible. I mean do you think they would accept me? Do you think it would be safe for me? PEREZ: In his resignation letter, Wilson wrote, "I have been told that my continued employment may put the residents and police officers of the city of Ferguson at risk, which is a circumstance that I cannot allow." After the grand jury decided not to indict Wilson, violent protests erupted here and then spread across the country. PEREZ: For nearly a week now, protests have continued. On Black Friday, groups disrupting big box retailers and forcing one St. Louis mall to shut down. PEREZ: Pastor Willis Johnson's church is just down the street from the Ferguson police state, the target of many protests. He condemns the violence, but understands the anger. (on camera): Why is this so emotional for so many people? PASTOR WILLIS JOHNSON, WELLSPRING CHURCH: It's so personal. It's so -- so hurtful to know that there's no recourse, there's no sense of respect, there's no dignity. PEREZ: What's next for Ferguson, do you think? WILLIS: Very tough conversations, very real work. PEREZ: And Pastor Johnson says his sermon today will be about holding the entire community responsible and finding a place of hope and healing for Ferguson -- Martha. I'd like to welcome St. Louis alderman, Antonio French, back to our show. Mr. French had an office in the heart of Ferguson, on the street we have all come to know, West Florissant Avenue. And as you see right there, that office was torched during the first night of disturbances. Thanks for joining us, alderman. Let's go right to the risk for police officers and residents that Officer Wilson talked about, said that's why he is resigning from the police force. ANTONIO FRENCH (D), ST. LOUIS ALDERMAN: Well, I think that there are many reasons that Officer Wilson should have resigned, and, quite frankly, why Officer Wilson and others should resign. I think the safety of his officers and his fellow officers is one of many. But I do think it was impossible for him to return to the force. But I think there are many more resignations that need to happen in order for this community to begin healing. RADDATZ: And what kind of resignations? Who do you think should resign? FRENCH: Well, I think the Ferguson police chief. I think it's impossible for this community to move forward with him still in that role. I think at the St. Louis County Police Department level, there still needs to be some people that answers for how the police responded to peaceful protests in August, which really escalated the situation. Frankly, the thing we haven't seen is a lot of government accountability. Not many people have taken responsibility for what's happened and people are still waiting for -- for answers and change. RADDATZ: Did you believe Officer Wilson's testimony? FRENCH: No. I found Officer Wilson to be remorseless, cold and frankly a lot of his answers sounded like they were prepared by a lawyer. So what I worry is that, as we said back in August, that the way this trial or this -- this grand jury process was being carried out by the county executive -- I'm sorry -- by the county prosecutor -- that it really doesn't give what the community needs in order to move forward -- no closure, no resolve and, in fact, it just creates more anger. RADDATZ: Let's talk about the aftermath. As we saw, your office was burned. Your own storefront office, which was called Heal St. Louis. Do you think there could have been a better response? Let's listen to Captain Ron Johnson from the Murray -- Missouri State Highway Patrol. CAPT. RONALD S. JOHNSON, MISSOURI HIGHWAY PATROL: If any of us knew last night was going to be what it was, if we had a crystal ball, we would have probably done something different. But we could have never imagined that. RADDATZ: Is that right, could they never have imagined that? FRENCH: No, I don't think that's right at all. You know, we've been talking for weeks about this and that, you know, we really had a powder keg here. And so for the county prosecutor to decide to release the grand jury announcement at nighttime, for the governor to preemptively call a state of emergency and call in the National Guard, yet no one deployed them to West Florissant or other areas that had been hit repeatedly by violence, it really showed a failure to grasp the situation and to handle it on the part of government. And so the fires that we saw, the violence that we saw was unfortunate. It is -- you know, it really hurts our hearts. We've gone through a tough week here. But, you know, we knew that a lot of people were very angry and we knew a lot of people were coming from other places. So we should have been better prepared for this. RADDATZ: And we'll hope we can all move forward. Alderman, thanks for joining us. And now let's turn now to what all of this means for how our nation's police patrol the streets. The officer at the center of this story, Darren Wilson, told George in their exclusive interview, that what happened on that night in August was the result of his training. STEPHANOPOULOS: You describe, I guess, the fear you were thinking. You thought he was coming after you. But is any part of you angry? WILSON: No. There was no time for anger. Like I said, training took over. It was survival mode. STEPHANOPOULOS: Because some of the witnesses have said they thought you were out of control, that somehow you had snapped. WILSON: That would be incorrect. There was never -- the only emotion I'd ever felt was fear and then it was survival and training. STEPHANOPOULOS: And the training kicked in? WILSON: The training took over. It didn't just kick in, it took over. STEPHANOPOULOS: And in your training, there was no option in those moments when you were faced with Michael Brown but to shoot? RADDATZ: I'm joined now by Ray Kelly, former commissioner of the New York City Police Department and a consultant for ABC News. Commissioner, give me your reaction to Officer Wilson resigning. was that the right thing to do? RAYMOND KELLY, FORMER POLICE COMMISSIONER, NEW YORK CITY: Well, I think it was the right thing to do for Ferguson and the right thing to do for Officer Wilson. I mean, realistically, he couldn't patrol those -- those streets again. And we'll see if it has any calming effect on the situation, but that remains to be seen. RADDATZ: Commissioner Kelly, we're not expecting you to -- to be the spokesman for police across the nation, but you have spent your life as a police officer. KELLY: Well, I think it's -- when you say the lessons learned, I -- I would like to sort of separate the incident itself from what happened immediately after the -- the incident. And there are lots of lessons for policing. What people say is this was a major league event happening in a small town. They simply didn't have the resources to cope. They didn't put information out quickly. And that's like rule one. When something happens, you give the public what you have and say, hey, we don't have this, we don't have that. There was a long delay in putting information out. Obviously, Michael Brown's body laying in the street for four hours was just -- no, a mistake. and one of the reasons given was is that the delay for the crime scene unit to respond. It took over an hour and 15 minutes. RADDATZ: So how -- how do you regain the trust of that community? How do police officers regain that trust? KELLY: It's going to be difficult, no question about it. I think you need communication, lots of talking. And I think they have to diversify the department. I would hope that the Justice Department is going to contribute or Homeland Security will contribute some -- some money for this effort. But you can't have a city that's two thirds African-American placed by a department of 53 police officers where only three of them are minority. It makes no sense. And I think it really -- it will refocus law enforcement on the issue of diversity, because a department that reflects the city or the municipality that it serves is much easer to police. It's smarter policing to -- to have that type of a relationship. RADDATZ: I just want you very quickly, if you can, on training, I know we heard Officer Wilson and others say they use deadly force when they're threatened or someone else is threatened. A 12-year-old boy was shot this week with a very realistic looking fake gun. But can you try to disable the suspect instead of killing him? KELLY: We're talking about deadly physical force being used against the officer. We're looking at the four corners of Officer Wilson's statement. That's what he's saying. And again I know we have the issue with the 12-year-old boy. But the notion that somehow you can shoot to would just simply doesn't work. You train police officers to shoot for mass. You train them to shoot to stop. And the only way you can, well, wound somebody or shoot a weapon out of their hands is in the movies. Police only hit their targets 20 percent of the time. RADDATZ: OK. Thanks very much for joining us today, Commissioner Kelly. Now to the NFL and the bombshell ruling Friday that former Baltimore Ravens running back Ray Rice can play again. In that ruling, a retired judge said Rice did not lie to NFL Commissioner Roger Goodell and that the league was wrong to suspend the former All-Pro indefinitely after he was caught on tape punching his then-fiancee. So what's next for Rice and the league? Here's ABC's Ryan Smith. RYAN SMITH, ABC NEWS CORRESPONDENT: That shocking video released in September of Ray Rice punching his then-fiancee Janay triggered a firestorm. NFL Commissioner Roger Goodell upping Rice's initial suspension for domestic violence from two games to indefinite, claiming Rice downplayed the assault in a June meeting. UNIDENTIFIED MALE: It was clear there was an act of domestic violence. But it was inconsistent with the way he described what happened. SMITH: But in a ruling, a retired federal judge calling the NFL's additional suspension of Rice arbitrary and an abuse of discretion, noting, "I am not persuaded that Rice lied to or misled the NFL," even flagging the league's handling of previous domestic violence cases, saying Rice's mishandled suspension speaks to their admitted failure in the past to sanction this type of conduct more severely. UNIDENTIFIED MALE: Goodell knew exactly what happened and his reaction with the indefinite suspension was based more on public outrage than it was on fact and circumstance. SMITH: When the assault happened back in February, Rice agreed to a court-ordered domestic violence program. Later, publicly apologizing to his wife. RAY RICE, BALTIMORE RAVENS: I made the biggest mistake of my life, me. She can do no wrong. She's an angel. SMITH: Rice saying in a statement after Friday's decision, "I will continue working hard to improve myself and be the best husband, father and friend while giving back to my community and helping others to learn from my mistakes." And his wife, Janay, telling ESPN's Jemele Hill, "We have no guarantees about Ray's future in football. But I know this experience has made us far more aware of what's important and how fortunate we are. For the NFL, the controversy isn't over. There's another investigation into the league's handling of the evidence in this case. And Rice claims he's owed millions lost since being suspended. But for now, as Rice hopes to get back on the field, the question is, will any NFL team have him? RADDATZ: And Ryan Smith joins us now, along with "USA Today" columnist and ABC News contributor Christine Brennan and ESPN's Jemele Hill, whose new interview with Janay Rice was released on Friday. And let's quickly get to the question you left us with, Ryan. Will he play again? Word this morning of being from ESPN that four teams are looking at him. SMITH: Right, and I think that's common in cases like this; a couple of teams are looking at him, considering him. It's near playoff time. So some teams need the help of a star like Ray Rice. But I think at this point nobody is speaking out and saying specifically we are looking to sign him. So I think he's got a little ways to go before he gets back into the league. RADDATZ: Christine, will he be back? CHRISTINE BRENNAN, "USA TODAY": I don't think this year. I think it's too much of a public relations nightmare really, it's a real roll of the dice, Martha. The Colts were one of the teams being mentioned. Immediately they sent out word, "We are not interested." I think we'll see that from other teams. JEMELE HILL, ESPN: Thank you for having me. Right how his brand does feel -- the situation still feels a little bit toxic. But I do expect fully that he will play in the NFL again. RADDATZ: OK, Ryan, let's go to how the NFL handled this. We have word this morning from the general counsel -- no part of Judge Jones (ph) decision, questions the commissioner's honesty or integrity nor his good faith consideration of the issue when he imposed the indefinite suspension. SMITH: It depends. I think what they're doing is a little bit of a PR campaign for Roger Goodell, because, think about this, it's the owners who have the hiring and firing ability with respect to his job. So what they did was they put out something, saying, well, this is what we did and this is what the explanation was. But hey, he wasn't dishonest. He didn't do anything wrong. SMITH: -- to me, it seems that Goodell wasn't telling the full story. CHRISTINE BRENNAN, ABC NEWS CORRESPONDENT: September 8th will go down as one of the watershed moments in sports and in our culture, the day we saw the video. Everything changed. Look at the Atlantic State (ph) prosecutor, slap on the wrist. The grand jury saw those videotapes and did almost nothing. So when the NFL was buffeted by this incredible news and seeing the video, all of a sudden, a two-game suspension they, of course it was double jeopardy, went right to the indefinite suspension. But the nation was screaming out for that. So you've got the internal politics, understandable, and very important between a union and the commissioner. But then you also have the court of public opinion, which was really driving this story. RADDATZ: Jemele, are we asking too much of the NFL, to deal with this huge, huge problem? HILL: In some ways, yes. I mean, we have to remember the NFL is a talent-driven production-based business. It's a billion-dollar business. Its first and foremost duty is to put on really good football games and to entertain us. And while certainly they can set their standard as a league, it's certainly for any corporation, there should be a certain moral standard that you want to abide by. But we're asking Roger Goodell and the NFL to fix domestic violence, as Christine noted. Let's start to where this all started. The Atlantic City prosecutor, with our laws, they looked at this video and this is what they ultimately decided. So if you want to put any pressure, if there's any outrage, it should be on how this originally started, because they felt like what he -- the punishment that he received was suitable. RADDATZ: So does Goodell stay? SMITH: I think he does for right now. But I think that comes down to more of a money point. My thinking is if you lose a major sponsor because of this controversy, his job could be in jeopardy. But right now, he's got an investigation going into things like did he know about this video? And right now it looks like he didn't. But if he's found to have known about that video, he could have real problems in terms of his honesty. But he does well by the owners. And the owners want to keep him in that spot. So as long as they want to keep him, he stays. RADDATZ: How about getting a neutral arbitrator? UNIDENTIFIED FEMALE: Well, that's what the union wants, obviously. RADDATZ: They failed (ph) this decision. UNIDENTIFIED FEMALE: They did. But the collective bargaining agreement, they gave away that opportunity. They gave that power to Roger Goodell. So Jerry Jones said yesterday or the day before, he said, we don't want to go back and look at the collective bargaining agreement on this. The owners are happy with the way it is. Of course they are. They're billionaires. And they're also happy with Roger Goodell and the way he's handled this. And I don't think he's going to go anywhere. RADDATZ: Jemele, just very quickly, what's your takeaway from your interview with Ray Rice's wife? HILL: I think that she was a -- she's a very powerful, impressive young woman. And I sort of circle the world "young," it's because I think lost in all this, we forget their ages. You know, she's 26; he's 27. They're a young couple. They've known each other since they were 14 and 15. And so while I know people, we've sort of been taught the narrative about domestic violence and I know some people will read this piece and say, oh, this is just in line with what we think and how we expect somebody to respond. But I found her to be extremely genuine with everything that she said. RADDATZ: OK. Thanks very much to all of you. This issue will not be going away for sure. But coming up, it's the busiest travel day of the year. But if you're a frequent traveler, you know the lines, congestion and full planes are all just part of the new normal. So what can be done? The head of the FAA is here next. Plus Pope Francis in a historic visit to Turkey, asking for tolerance. Will he become the foreign policy pope? We're back in less than two minutes. RADDATZ: Back now with our closer look. And if you're watching us in an airport while waiting to get home today, good luck, because you're not alone. Millions are expected to travel on planes, trains and of course automobiles today. ABC's David KERLEY joins us from Reagan National Airport with the numbers behind a nation on the move. Good morning, David. DAVID KERLEY, ABC NEWS CORRESPONDENT: Good morning, Martha. It really is remarkable, this holiday week nearly 13 percent of this country's population is on the move. Today, though, the busiest air travel day with an air traffic control system that is in need of an upgrade. KERLEY: This Sunday we could see long airport lines, possibly even delays for millions of Americans. After the last leftover, we're heading home. Wednesday travel was tough, more than 700 flight canceled, 5,000 delayed because of that snow. In Atlanta, Delta invited us into its tower and showed us the complicated logistics to get you and your bag home. Here, we saw some 40 miles of conveyor belts. UNIDENTIFIED MALE: That's our busiest day. It is truly our Superbowl. It's one of our busiest days that will be all year, including the summertime. KERLEY: One in eight of us traveled this Thanksgiving weekend to be with family, 90 percent of us behind the wheel. With average gas prices well under $3 a gallon it's one of the best deals of the season. But, airlines aren't passing on their fuel cost savings, tickets up about 1 percent this year as airlines hold the line on capacity, keeping jets full, those empty middle seats just about a thing of the past. But the future showed up this weekend with the FAA activating its next gen air traffic control system in the nation's capital. The GPS-based system gives pilots a straight line descent, their own lane into the airport, saving fuel and more on time arrivals. But it's not all clear skies out there. UNIDENTIFIED MALE: We just had something fly over us. I don't know if it was a drone or a balloon. KERLEY: Increased reports of drones flying too close in airport airspace illegally. 200 incidents since February, a half dozen of those close calls, forcing pilots to change course. KERLEY: That sounds like a surge, and it may be. Earlier this year, the FAA asked pilots to report every drone incident, now numbering 25 a month as these relatively inexpensive drones become more popular and potentially more dangerous -- Martha. Michael Huerta of the administrator of the FAA joins us now. Thanks for joining us. Today is expected to be the busiest travel day of the year. I think about 2.61 million people forecast to fly home today. You said this week, 15 to 18 percent increase in flights compared to a typical Saturday. Weather looks good. So what's the move important thing here today to keep things moving? MICHAEL HUERTA, FAA: Well, 46,000 flights today, a little over that, and fortunately we have great weather today. A little bit of rain in the San Francisco Bay area, which is very much needed there. But it should be a good day for flying. RADDATZ: And going forward, I know you -- how this next gen system that is supposed to reduce air traffic, save fuel costs, all kinds of things -- don't have to talk to air traffic control enough -- but it's been criticized widely by Democrats, by Republicans that it's late, that the 2020 start date is fiction, that it's moving at a snail's pace. Why is that? And what do you hope will happen? RADDATZ: Three airports, right, yes. RADDATZ: But it's still way behind schedule. HUERTA: Its not. Actually, we have built out the foundational technologies. And that had to be put in place before we could start delivering the benefits. And the benefits are being delivered right now. RADDATZ: Let's move to the drones that David also mentioned in his piece. Your own FAA numbers that since June, pilots have reported 25 near collisions. Could a drone bring down a plane? I'm thinking of the geese that brought down the US Airways flight into the Hudson River, that was a flock of geese. And we're talking about drones. And they're pretty big. HUERTA: The thing that I'm most concerned about is doing everything that we can to avoid conflicts between aircraft, whether they're drones or whether they're commercial airliners. And if you're using an unmanned aircraft, you need to stay away from an airport, you need to stay below 400 feet and you need to maintain line of sight. There's also an educational component. We're working closely with the model aircraft industry to make sure that there's an awareness out there of the conflicts that could exist. And I think as a result of this awareness, we're seeing more reporting. We've asked pilots to report when they encounter incidents. And then we have enforcement tools. RADDATZ: And there's a drone policy, an overall drone policy we can expect beyond where you're talking about. HUERTA: Well, last year we published a roadmap for integration of unmanned aircraft into the national airspace system. Later on this year, we expect to solicit comments on a rule for small unmanned aircraft, those that are under 55 pounds. RADDATZ: And what might it look like? HUERTA: Well, it looks at -- I can't talk about what's in the rule, because we're still in that process, but what it will consider is the full scope of activities, the certification of the aircraft, the qualifications of the operator and the sorts of uses all with the goal of maintaining a safe system. RADDATZ: And do you think the fuel prices -- just quickly on the fuel prices that David also mentioned -- I know this really isn't your avenue here, but should airline prices, should airline tickets come down because the fuel prices are coming down oil prices coming down? HUERTA: Well, that's a decision for the airlines. They're always looking to reduce their expenditures. But you talked about Metroplex earlier, or next gen. Here in Washington, this is going to save the airlines 2.5 million gallons of fuel a year just in Washington. RADDATZ: Well, we hope we see that in ticket prices, even though that's not your job. Thanks very much for joining us, Mr. Huerta. RADDATZ: Coming up, qualified applicants needed, must be able to juggle multiple world crises at the same time. President Obama goes on the hunt for a new defense secretary. 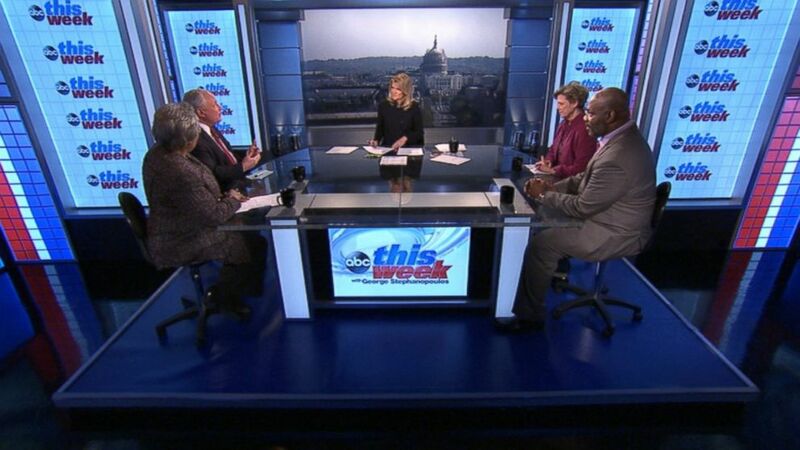 Plus, the roundtable tackles all the political fallout from Ferguson. We're right back. RADDATZ: Coming up, yet another tough week for the president. His defense secretary steps down, he takes heat for his remarks about Ferguson and one prominent Democrat now questioning Obama's signature legislative accomplishment: Obamacare. We'll break it down next. RADDATZ: It's usually considered one of the most prestigious of the president's cabinet appointments, but for the fourth time in six years, President Obama is on the hunt for a secretary of Defense, after Monday's resignation of Secretary Chuck Hagel. With trouble spots in Iraq, Syria, Russia and a host of other countries, the landscape looks pretty complicated for the next nominee. RADDATZ (voice-over): The world looked a little different when President Obama nominated Chuck Hagel for secretary of Defense. BARACK OBAMA, PRESIDENT OF THE UNITED STATES: America's war in Iraq will be over. RADDATZ: With the Bush-era conflict seemingly coming to an end and a peace dividend to be reaped, the president decided reform-minded Hagel was the right choice for the job. RADDATZ: Guiding the Pentagon through tough budget cuts and restructuring. But it was rough out the gate -- gaffes at the confirmation hearing. UNIDENTIFIED FEMALE: And then the deluge of world crises, just a few months after the Secretary took office. (on camera): Chemical weapons were deployed against the Syrian people. UNIDENTIFIED FEMALE: We begin with the urgent situation overseas in Ukraine. RADDATZ: And finally, ISIL. Hagel famously veering way off administration talking points and hitting the panic button. HAGEL: They are an imminent threat to every interest we have. RADDATZ: By last month, he sounded a bit awestruck about it all. HAGEL: I think we are living through one of these historic, defining times. I think we are seeing a new world order. RADDATZ: Add a thumping in the midterms, the president's approval rating on foreign affairs at a record low 31 percent and it was Hagel, seemingly the odd man out in White House debate, who was pressured to resign less than two years after he started. RADDATZ: And I'm joined now by David Rothkopf, the CEO and editor of "Foreign Policy" and author of the book, "National Insecurity," and Bret Stephens, the national security columnist at "The Wall Street Journal" and author of the book, "America In Retreat." Glad you're here this morning, gentlemen. You had been urging in your writing for the president to shake up his cabinet, his national security team. But do you think they got rid of the wrong man? DAVID ROTHKOPF, CEO AND EDITOR, "FOREIGN POLICY": Oh, yes. This -- Hagel was a sacrificial lamb. The reality is, the problem is in the White House. The problem is that this administration takes too many decisions there, micromanages too much from there and has divided themselves within the White House about whether they take a strong stance on a group like ISIS or they take halfway measures. That causes problems down the line. Hagel is a victim of those problems, not a cause of them. RADDATZ: One of the things, Bret, there were some whisperings that Hagel had sort of gone native in channeling the frustrations of the military. Or do you agree with David? BRET STEPHENS, "THE WALL STREET JOURNAL": Well, I agree David in the sense that the whole Hagel -- Hagel saga from the moment of his nomination up until right now is so emblematic of everything that's wrong with Obama's management style. I mean he went out of his way to pick a fight with Congress in -- in nominating Hagel. I don't think the White House then saw just the kind of opposition he would get or how poorly Hagel would -- would perform. They also touted Hagel as an independent thinker, and yet when he turned out to be somewhat less politically pliant than they needed him to be, they -- they turned on him. I mean I am almost tempted (INAUDIBLE) they should -- they should ask Ron Klain to be secretary of Defense, because if they want a political fixer in the Pentagon, they ought to get one. RADDATZ: And -- and who -- we've heard the names. Michele Flournoy already turned it down. We've got Jack Reed, who wasn't interested either. Does it matter who he puts in? I know the names floating out there -- Jeh Johnson, Ash Carter? ROTHKOPF: It -- it probably doesn't matter, because at the end of the day, because the White House micromanages, because so many of the decisions are taking place in the White House, this person is being seen as a -- somebody to follow through on that. There are some names that are a little stronger. I mean Ash Carter is a -- is a very tough, independent guy. And they picked him, they would be sending a message that they do want diversity of opinion more than it seems to right now. RADDATZ: Let -- let's move on to the crises that we're facing in the coming years. A lot of presidents want a legacy in foreign policy. President Obama seems to be concentrating on domestic issues. But these crises are going to slap him in the face. ISIS isn't going away. Syria is not going away. Ukraine is not going away. Just take us forward here, Bret. STEPHENS: Well, the scary thing is that we have a series of crises and we have adversaries who think that there's a weak president in the White House who's not going to act against them. And I think that's true of Vladimir Putin. I think that's true of the Ayatollah Khamenei in Iran, throughout the world. So it's important not to just put in the technocrat in the Pentagon. You know, you have a kind of a flock of seagulls here with -- with the Obama administration team. There needs to be a hawk in there in a prominent position. So I think the president would be making a mistake by putting in a technocrat like Ash Carter. He needs a strong voice. RADDATZ: We've got about 10 seconds, David. And just looking forward with the foreign policy crisis. ROTHKOPF: I think it's going to get worse, it's going to be very tough the last couple of years for the president. RADDATZ: Well, on that note, thank you very much for joining us. Coming up, did the president miss the mark when he spoke out on Ferguson? The roundtable is here to debate that in less than a minute. RADDATZ: Back now with our Politics Buzzboard. Topping it off, Democrat versus Democrat. New York senator Chuck Schumer said his party misread the results from the 2008 election and it's now costing them politically. Following major midterm losses, Schumer took aim at President Obama's signature legislation -- The Affordable Care Act. SEN. CHARLES SCHUMER (D), NEW YORK: Democrats blew the opportunity the American people gave them. We took their mandate and put all of our focus on the wrong problem -- health care reform. RADDATZ: He said Democrats should have focused on issues affecting the middle class first. Criticism of Obama continued with Tweets and headlines drawing attention to the Monday night split screen image of President Obama calling for calm even as smoke filled the streets of Ferguson. RADDATZ: And we're joined now on the roundtable by Bill Kristol, editor of "The Weekly Standard," Democratic strategist Donna Brazile, Jelani Cobb of "The New Yorker," who was in Ferguson as the rioting broke out there this week, and our own Cokie Roberts. Jelani, I want to start with you. You told me when we talked yesterday that you do not believe Officer Wilson. JELANI COBB, "THE NEW YORKER": No. The story he told was fantastic. It almost sound like -- sounded like the kind of beginning of a superhero film of some sort. He actually said that when Michael Brown was shot, it seemed that he was bulking himself up to run back toward him. You know, bullets don't cause people to gain mass. RADDATZ: You also had some pretty strong words about the president. Let me -- let me read what you wrote in "The New Yorker": "Obama took pains to point out that there is never an excuse for violence. The man who once told us that there was no black America or white America but only the United States of America has become a president whose statements on unpunished racial injustices are a genre unto themselves. COBB: What I mean is this -- you know, the president spoke in a very evenhanded way about this, as he tends to do in these matters. But not everything is even. There's not a kind of even distribution of concern here. People became very upset about the prospect of property damage in Ferguson. But the people in the community were saying we are concerned about not only Michael Brown's death but the context in which his death seemed almost if not predictable then not shocking. And so in that regard, we can't make a property offense be equivalent of a person losing their life. Now I'm not going to actually defend attacking someone's business. But these two things are not equivalent. COKIE ROBERTS: Well, and what's mystifying to me is why they did anything they did. ROBERTS: -- yes, have a regular grand jury proceeding and then go to an open trial, where you have a defense lawyer and a prosecuting lawyer and all the evidence is out there with the jury and everybody can hear it. This way, it just seems that they were fixing it. And that's of course, how the community feels. And it contributes to this sense that black Americans, particularly young black males, do not get a fair shake in the American justice system. BRAZILE: Yes, this is their "Broadcast News" (sic) moment. I'm angry as hell. These young people are looking at this and saying, you know what, this could be me. This is the authorities. This is -- these are people who are sworn to protect me and now they're coming after me. RADDATZ: -- jump in on this. Should it have been a different procedure? Should they have not had the grand jury? UNIDENTIFIED MALE: On what basis should someone be brought to trial? KRISTOL: Don't you think the forensic evidence is pretty determinative in this case? COBB: No, it actually wasn't, because they said that this blood was inside the vehicle as (INAUDIBLE) Johnson, the person who -- the only other eyewitness there said that his blood was in the vehicle because Officer Wilson had grabbed Michael Brown. Do we really believe that the officer pulled up and said, hey, guys; why don't you get on the sidewalk? And if, as Bob McCulloch said, that they were aware of the purported robbery in the store, why would he tell them to get on the sidewalk as opposed to questioning them about whether or not there had actually been a robbery? RADDATZ: -- also 16, I think 16 of the 29 witnesses who said they saw him raise his hands. I mean, how -- let's just move forward with this. How do you reestablish trust in that community? ROBERTS: Well, I mean, one of the things that I can't get over is here we are in 2014, and we're still having these all-white or almost all-white police forces in majority black neighborhoods. That's just nuts. And why would that be true? We know how -- you know, we know how to fix this. And we know it works, by the way. It does work to have people who are out from the community in the community. RADDATZ: OK. I want to move from 2014 to 2016, not a very smooth transition, I know. But Rand Paul, (INAUDIBLE), Rand Paul is what -- is the only potential 2016er who's wading into the Ferguson discussion. And really trying to reach out to young African Americans and bring them into the Republican tent. You wrote that Republicans didn't lose the black vote but forfeited it. What advice would you give to Paul to get the black vote (INAUDIBLE)? UNIDENTIFIED MALE: Well, I mean, his main problem is the Republican Party, you know, because you can't attract -- and this is not something that's just simply him. You know, George Bush said this in 2000; if you go back even the earlier to the late '80s, Lee Atwater said something similar. But you run into the conflict of, you know, the other parts of your party. You cannot attract African Americans on one hand while you have blatant issues of voter suppression on the other. People are going to vote their interest. RADDATZ: OK. Rand Paul is targeting younger voters as well. Let's take a look at our Facebook senti-meter. He is among the most talked about potential GOP candidate in the 18-34 year-old range, second only to Ted Cruz. And take a look at how they view him. Perry, 61 percent positive; Rand Paul, 57 percent positive; Ted Cruz, 37 percent positive. What do you think there, Bill Kristol? KRISTOL: I think Rand Paul is totally overrated as a 2016 possibility. The media loves him. The media loves him because he takes a couple of liberal views, publicizes them in an incoherent way. I predict Rand Paul will get fewer votes than his father got in 2012. He's as -- he's more dovish than President Obama on foreign policy. Republican voters aren't. And on law and order, yes, Republican voters -- and I think most Americans -- and I think an awful lot of African Americans think whatever injustice might happen in any individual case -- and God knows there are cops who make mistakes and do things that they shouldn't do -- maybe not enough to get indicted. Nonetheless, there's no excuse for rioting and there's no excuse for people apologizing for the destruction of property and the endangering of life. Law and order's not just a political (INAUDIBLE). It really is part of a decent society. RADDATZ: Well, hey, I want to -- I want to very quickly -- because this was -- stood out to me, the -- speaking of Facebook -- the Facebook post on Sasha and Malia at the turkey pardoning this week. (INAUDIBLE) in honor of Thanksgiving. We saw the 13- and 16-year-old girls. They're looking a little bored. But then we hear Elizabeth Lawton (ph), who is a congressman's communication director, "Dear Sasha and Malia, I get you're both in those awful teenage years. But you're part of the first family. Try showing a little class, at least respect the part you play. "Then, again, your mother and father don't respect their positions very much. Dress like you deserve respect, not a spot at the bar." Give me 10 seconds on that, Cokie. ROBERTS: It's ridiculous. But she's probably 18. I mean, is there -- cuts across that way. Social media is a problem and people should stay off of it, particularly if they've had any substance that they shouldn't be on. RADDATZ: Or a big Thanksgiving meal and it's late at night. COBB: Really exciting. They look really exciting -- excited, but they were buying books. (INAUDIBLE). RADDATZ: That's right. That's a good thing. That's always exciting, to buy books. ROBERTS: (INAUDIBLE) that strategy is pretty dumb. RADDATZ: Not my favorite event of the year, either. OK, coming up, what's it like to be the tailor to the president? But before we go to break, our "Powerhouse Puzzler," and it's Thanksgiving-inspired, naturally. Of course we now celebrate Thanksgiving on the fourth Thursday of November. But that practice was solidified only after one of our presidents tried moving Turkey Day. So here's the question: name the president who moved Thanksgiving up a week from when it had been traditionally celebrated up to that point. Back in less than 60 seconds. RADDATZ: The president who moved Thanksgiving? Let's see those white cards. (INAUDIBLE) who's going, what are we doing? RADDATZ: Who was Roosevelt, FDR? OK.
Three for four, pretty good. The answer is FDR. So concerned with the shortened Christmas shopping season in 1939, issued a proclamation moving the holiday up a week to the second-to-the-last Thursday in November. The result was kind of a mess, with some states going along with the move and others not. It was two years later that Congress ended the confusion by passing a resolution making the fourth Thursday of November the day we now mark the holiday and begin shopping. RADDATZ: Pope Francis spending his Thanksgiving weekend in Turkey, his first visit to a predominately Muslim country. In a message directed at a larger audience, the pope called for the people of the Middle East to reverse the trend of violent conflict. ABC's Alex Marquardt has been along for the trip and joins us from Istanbul where the pope is finishing up this landmark trip. Good morning, Alex. The pope today is wrapping up his three day trip to Turkey, a trip that is focused on improving dialogue not just with the Muslim world, but among Christians as well. It's that kind of interfaith dialogue, the pope says, that will help bring peace to this region as well as to help stop the spread of extremism. The pope's visit comes as the Turkish government grapples with how to deal with the threat from ISIS just across its borders, a threat highlighted yesterday when ISIS attacked a border crossing between Turkey and Syria with suicide bombers. This morning, the pope held a service for some of Turkey's tiny Christian minority with the head of the orthodox Church, part of his effort to bridge the divide with the Catholic Church. This came after his visit on Saturday to Turkey's most important mosque, the famous Blue Mosque where for two minutes he bowed his head in what the Vatican called a moment of silent adoration. And this afternoon, he will cap off his trip by meeting with a group of Iraqi and Syrian refugees, just a fraction of the more than 1.5 million refugees who have fled to Turkey to escape the fighting in those two countries -- Martha. Cokie, the pope really walked a very fine line on the visit to Turkey. ROBERTS: He did -- he did it just right. I mean, he went to the president who is an Islamist and said, you know, we have to stop this barbaric violence, but you're doing a good job of bringing in the refugees. And then he went to Ataturk's mausoleum, which is a secular, very secular scene. And then on to the patriarch of the eastern Orthodox churches to try to bring together unity there. His message has been consistently, you know, we have to do more to end violence and to promote well-being, end hunger in Europe -- he did the same thing. He's really done quite a job. RADDATZ: OK. And we couldn't let this weekend pass without talking about our own thanks and what we're thankful for this Thanksgiving weekend -- Donna. BRAZILE: Family. My family came up from Louisiana. They've bought their own crabs and crawfish with a delicious gumbo. I'm going home and make creole cornbread that Cokie just gave me a recipe. I'm also thankful for so many friends. And let me just say this, there are many public servants who are retiring this year -- Tom Harkin, of course George Miller -- and they've been great people as well. KRISTOL: Yeah, family and friends and country. And I think those -- you'd agree with this one, I think those who serve us overseas and are deployed -- were this Thanksgiving and weren't with their families. RADDATZ: I certainly would echo that. COBB: I'm thankful for my family, especially my nephew, Josh who I'm very proud of, who is a budding journalist himself. And particularly I'm also in the kind of political arena, I'm thankful for the example of sustained mostly non-violent protests that people were able to organize in Ferguson for so long prior to, regardless of whatever happened last week. RADDATZ: And Cokie very quickly. ROBERTS: Well, and family, of course. And we've had a tough year in our family this year. So having the people who have been so supportive makes a huge difference, but in politically I'm really glad that we haven't diminished the number of women in politics and it might even be higher. RADDATZ: Thanks very much to all of you. I'm thankful as well for so much. RADDATZ: Finally, from prison camp to presidential outfitter: it's in every presidential photo op, yet you almost don't notice, the perfect cut of the presidential suit. Martin Greenfield, tailor to the president, explains in his new book "Measures of a Man" what's hidden in those presidential pockets. DAVID WRIGHT, ABC NEWS CORRESPONDENT: Barack Obama and Michael Bloomberg have at least one thing in common their tailor. MARTIN GREENFIELD, TAILOR: I dressed (inaudible). WRIGHT: Martin Greenfield, whose suits are a cut above the rest. This is President Obama's jacket? WRIGHT: Only for presidents this stitching here. He dresses Hollywood, too. He made Leo DiCaprio's suits for the Wolf of Wall Street. Paul Newman was a customer of yours. GREENFIELD: Paul Newman -- Paul Newman was not a customer, was a friend. WRIGHT: Greenfield showed his first stitch not on 7th Avenue or Savile Row, but in Auschwitz where his job in the camp laundry kept him alive. And you had never sown before. GREENFIELD: I had never sown. I never washed. I never did nothing. So the tailor says you're a tailor, 15 years old. GREENFIELD: Eisenhower. He was like a giant. WRIGHT: Would one day become a customer of the Brooklyn tailor who taught Greenfield his craft. GREENFIELD: When the first time I could touch something for the man that liberated me, you know, the feeling? WRIGHT: He couldn't resist slipping notes into Eisenhower's jackets, offering advice on the Suez crisis. GREENFIELD: ...he told a WRIGHT about it. WRIGHT: Later, Bill Clinton turned to Martin Greenfield, too. GREENFIELD: He says can I tell you something, Martin? Do me a favor, don't write notes in my pocket. I said well, who told you I write notes? And he said, no, no, I'm going to give you a fax number, you fax me anything you want. WRIGHT: Greenfield's Italia in Brooklyn is old-school. GREENFIELD: Everything is made the old fashioned way. WRIGHT: About 120 workers, mostly immigrants, many of them have been working here 20 plus years. WRIGHT: Greenfield doesn't dwell on the holocaust, always keeping in mind his father's advice. GREENFIELD: The last words, "you honor us by extending our life by living not by crying. And that's what I do every minute of my day." WRIGHT: There's that old saying the clothes make the man. Do you believe that? WRIGHT: But a tailor also knows people in an intimate way. And I suspect that part of you would think that the measure of the man isn't just the clothes. GREENFIELD: The measure of the man is not just clothes, the measure of the man is more. WRIGHT: By any measure, Martin Greenfield is a treasure. GREENFIELD: A coat that fits him. WRIGHT: For This Week, David Wright, ABC News, Brooklyn. You can read and excerpt of Martin Greenfield's book at ABC News.com/ThisWeek. This week, the Pentagon announced the deaths of two soldiers killed in Afghanistan. That's all for us today. Thanks for sharing part of your thanksgiving weekend with us. Check out World News Tonight. And we'll see you back here next week. Have a great day.